http://www.engvid.com/ Are the words "each," "every," and "any" singular or plural? Which verb form should we use with them in the present simple? What about the word "some"? Never confuse these subjects and their verbs again! Everyone needs (or is it "need"?) to check this grammar lesson out. Don't forget to check your understanding with the quiz: http://www.engvid.com/english-grammar-subject-verb-agreement-each-every-any-some/ TRANSCRIPT Hi, guys. I'm Alex. Thanks for clicking, and welcome to this lesson on subject/verb agreement. 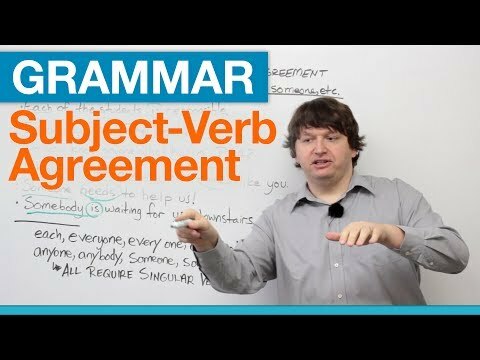 And today, we're going to look at subject/verb agreement as it relates to pronouns, such as: each one, anyone, someone, etc. Okay? Now, the most important thing to know about these subjects -- and again, you have the whole list here. You have: each, everyone, every one, everybody, anyone, anybody, someone, somebody. These are all singular subjects. So even though you have a word like "someone" -- you see the word "some"; you think it's plural -- focus on the "one", "some one", "some body". This means he or she, okay? So if you have words like these -- pronouns like these as your subject, the verb you use must also match them. It must be a singular verb -- basically, a third person verb. Okay? So they all require singular verbs. So here's what we're going to do. We're going to look at some example sentences, and I want you to identify, No. 1, the pronouns that we have discussed, and No. 2, the verb and what form the verb is taking. Okay? So the first sentence says, "Each of the students is responsible." Okay. First, we identify "each", okay? And we're talking about the students. Now, again, don't become confused by the plural of "students". You're thinking, "Students are 'they', so we say 'students are.'" The focus is on "each of the students", so this individual student, that individual student, you as an individual student, he, she, he, she, he, she. So your verb must be singular, which is why we say, "Each of the students is, not each of the students are," okay? The next one, "Everybody loves the Beatles!" This is an opinion, of course. Maybe you share it; maybe you don't. And here we have the subject, "everybody". And again, you're thinking as everybody as a group, but really, you're talking, again, "every body" -- if you take the word apart, you have "every body", every individual person loves. So the verb is not "love", but "loves". He loves. She loves. Okay? Next, "Do you know anyone who has a PS4?" So you have "anyone". And again, "anyone" -- you're talking about individuals, okay, which is why we have the verb "has" and not "have". "Anyone who has." So again, we say "he has" or "she has", not "he have" or "she have". Okay? The next sentence, "I haven't met anybody who thinks like you." So here, we have "anybody" -- "I have not met anybody" -- and again, we don't say "who think like you". It's third person. It's singular. So the verb is "thinks". So "he thinks, "she thinks", and not "anybody" as in, like, a collective group, but as an individual, okay? All right. The next two. These ones confuse people sometimes just because you see the word "some". And again, we know "some" has a plural meaning. However, look at the complete word. It's "some one" or "some body". And again, think of "body" as an individual, okay? So, "Someone needs to help us." So you have "someone", and the singular verb is "needs". "Someone needs", not "someone need". And finally, we have, "Somebody is waiting for you downstairs." So you're giving news to someone, and you're saying that they are waiting for you downstairs. So we have "somebody". And again, here we have a present continuous sentence. However, the first verb, the auxiliary verb, is the verb "to be" -- "is". We don't say "somebody are" just because you see the word "some". We focus on the "body", basically, the individual, okay? Okay, guys. So again, be careful when you see these words. Just always be aware. Basically, you're using the word "has". You're using the verb "is" or "isn't" or "hasn't" if we're talking about "has". If you're using present simple sentences, you're adding the S, okay, at the ends of the verbs after these pronouns. So again, when you see: each, everyone, every one, everybody, anyone, anybody, someone, or somebody, they all require a singular verb because they are all singular subjects. And one quick point before I finish, the difference between "everyone" and "every one" -- "everyone" refers to the whole group, and "every one" refers to every individual, okay, as a separate entity, essentially. Okay, guys. If you would like to test your understanding of this material, as always, you can check out the quiz on www.engvid.com. Take care.